As the 1960s drew to a close, the United States was coming apart at the seams. From August 1969 to August 1970, the nation witnessed nine thousand protests and eighty-four acts of arson or bombings at schools across the country. It was the year of the My Lai massacre investigation, the Cambodia invasion, Woodstock, and the Moratorium to End the War. The American death toll in Vietnam was approaching fifty thousand, and the ascendant counterculture was challenging nearly every aspect of American society. Witness to the Revolution, Clara Bingham's unique oral history of that tumultuous time, unveils anew that moment when America careened to the brink of a civil war at home, as it fought a long, futile war abroad. 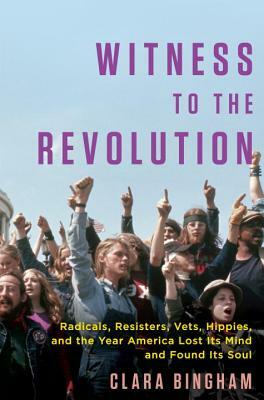 Woven together from one hundred original interviews, Witness to the Revolution provides a firsthand narrative of that period of upheaval in the words of those closest to the action--the activists, organizers, radicals, and resisters who manned the barricades of what Students for a Democratic Society leader Tom Hayden called "the Great Refusal." We meet Bill Ayers and Bernardine Dohrn of the Weather Underground; Daniel Ellsberg, the former Defense Department employee who released the Pentagon Papers; feminist theorist Robin Morgan; actor and activist Jane Fonda; and many others whose powerful personal stories capture the essence of an era. We witness how the killing of four students at Kent State turned a straitlaced social worker into a hippie, how the civil rights movement gave birth to the women's movement, and how opposition to the war in Vietnam turned college students into prisoners, veterans into peace marchers, and intellectuals into bombers. Clara Bingham is the author of Class Action: The Landmark Case That Changed Sexual Harassment Law (with Laura Leedy Gansler) and Women on the Hill: Challenging the Culture of Congress. She is a former Newsweek White House correspondent, and her writing has appeared in Vanity Fair, Vogue, Harper's Bazaar, Talk, The Washington Monthly, Ms., and other publications. Bingham produced the 2011 documentary The Last Mountain. She lives in Manhattan and Brooklyn with her husband, three children, and three stepchildren.